The visualization servers are intended for single-process pre- and post-processing only, as well as GUI monitoring of running jobs. These servers are NOT intended for parallel processing or running compute tasks. The system administrators will terminate processes that do not fit the above description without warning. 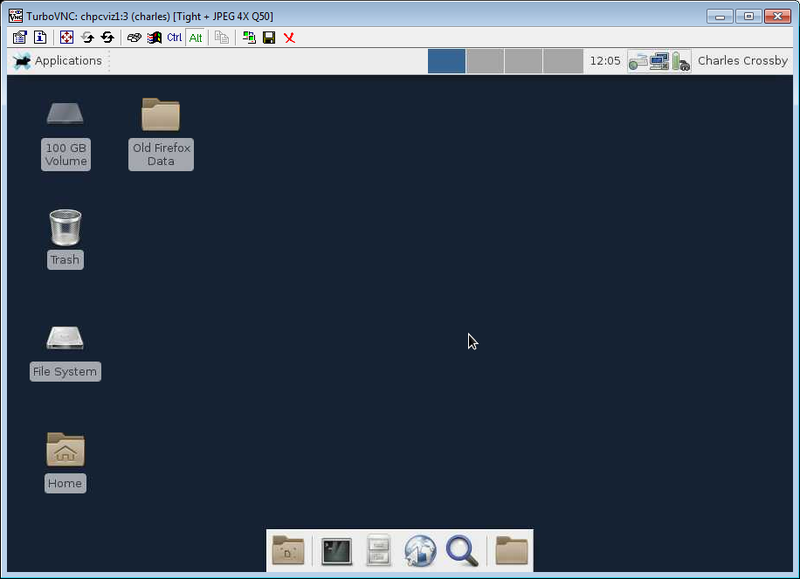 On chpcviz1, start up a TurboVNC server for your use. You can either leave this login session open or disconnect after starting the TurboVNC server, which will continue running untill it is manually shut down. Run your graphics program with vglrun, or run your entire virtual desktop session with the vglrun wrapper, as per the instructions given below. When starting up a VNC session for the first time on this system, start the default VNC server rather than TurboVNC. 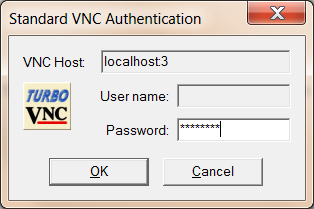 As with TurboVNC, the vncserver will ask you to specify a password if this is a first usage. You can immediately kill the vncserver, you only need its XWindows startup script as a template. Open xstartup.turbovnc in your favourite editor, and change the last of the three lines to read exec /opt/VirtualGL/bin/vglrun /bin/mate-session, exec /opt/VirtualGL/bin/vglrun /bin/xfce4-session or exec /opt/VirtualGL/bin/vglrun /bin/gnome-session depending on the your favored choice of desktop environment. Both mate and xfce4 work particularly well. It is not strictly speaking necessary to start your desktop session with the vglrun wrapper, but doing so makes it unnecessary to use it when running OpenGL applications in the desktop session. Now start a TurboVNC session as per the usual manner. If you have trouble with your configuration, or you have forgotten your VNC password, simply delete the $HOME/.vnc directory and start over. More than one VNC session can be run simultaneously. In this example, two other sessions are already running, therefore :3 is used to specify that this will be a session on virtual display 3. If this is unavailable, try :4, etc. 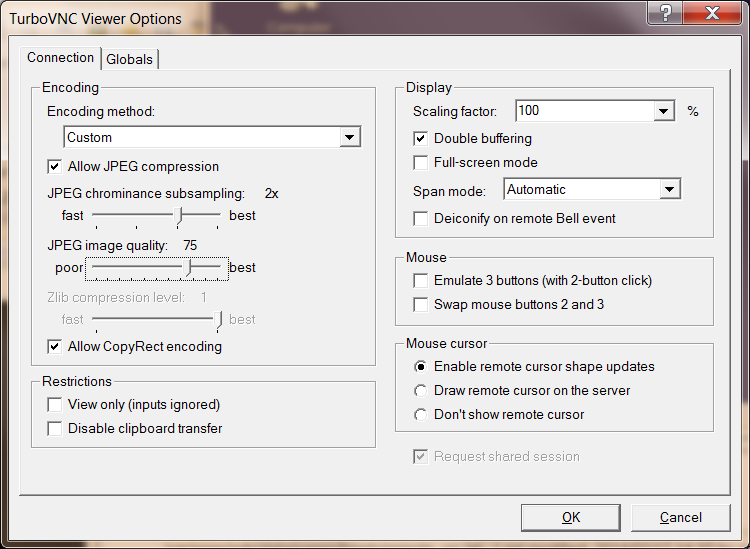 Optionally specify an appropriate display resolution and colour depth, as in the above example. If you get a warning of unsupported resolution, try one of the standard resolutions. The port number used for a VNC session is 5900+n , where n is the number of the display. In this example, the VNC session will be served on port 5903.
where :3 should be changed to whichever display the server has been running on. Obviously change “user” to your own user-id. The -f option puts the ssh session in the background. If you wanted to log in anyway (to log in to chpcviz1 to start the VNC server, for example), omit this option. The -L option is essential for tunneling. The -N option prevents ssh from executing a remote command. This should also be omitted if you want an interactive session. 5903:chpcviz1:5903 means that port 5903 on the localhost will be forwarded to port 5903 on chpcviz1. The port number on the local host is arbitrary, you can use any number greater than 1024. However, there is some merit in using consistent values. chpcviz1:5903 is the destination port, with the port number given by 5900+n, as described above. Any VNC client can be used to connect to the TurboVNC server on chpcviz1. However, to take full advantage of the higher speed and configuration options of TurboVNC, use the TurboVNC client as well. It can be downloaded from http://sourceforge.net/projects/virtualgl/files/TurboVNC/ . The Windows installer includes a customized version of PuTTY. Once TurboVNC has been installed, run the PuTTY in the TurboVNC installation directory. In the left pane, expand the SSH option, and click on Tunnels. Add the port number for your local host in the source port box, and chpcviz1:5903 (use the port number that your VNC server is using) in the destination box. Log in with your usual user-id and password. Click on connect and log in with the VNC password you provided when starting the VNC server for the first time. Experiment with the various settings. You can trade off quality for speed. On a slow connection, use fast low quality settings to set up the scene, then request a “Lossless refresh” to get a high quality image. will run a recent version of Paraview. If you have started up your X-windows session with the vglrun wrapper as per the first time instructions given above, it is not necessary to use it when starting the OpenGL application. The following $HOME/.vnc/xstartup.turbovnc file makes life easier. Pre-loading the right version of the OpenGL library also ensures that software that might have linked to a VirtualGL-incapable library is forced to link to a working version of the library. will shut down the VNC server for display 3, freeing up resources for other users.